We were asked the other day for suggestions on how you can practice your online contact forms & online lead generation forms in smarter ways to create value for you & your business. Some of the tips below might seem necessary but often overlooked by the majority of people who are creating their online forms. Don’t make them intimidating: Many people attempt to gather too much learning. Only collect the real important stuff (Name, Email, Phone if you need it). If you feel like you want a longer form use functionality similar “Conditional Logic” that permits you to show or hide data based on how someone answers a question. That process you can control what information gets displayed to whom. Use Redirects: As soon as someone clicks submit don’t leave them hanging. This is your opportunity to continue the conversation. Redirect to another page on your site for them to gain better insight into what you do. Send them to a specific promo page, whatever it keeps them engaged on your site. They just submitted information to you – they want to interact – keep them engaged. Do something with the information you collect: Don’t sit on the information. Respond to it right away. Even sending a confirmation message as soon as they fill out your form can go a long way in keeping communication going. Use Data Intelligently: Live Forms allows you to use Smart Routing to “route” data to different people depending on how questions are answered. 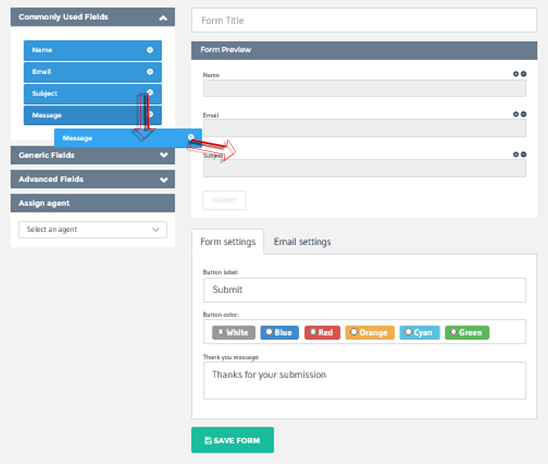 For Example, You have a sales lead form & the user can select a region; East Coast, West Coast & Midwest. Depending on what part the user wishes, route form submissions to the proper Manager. Having that information routed to the appropriate person allows you to act on the data quicker.